The word of God was proclaimed by the Word of God. Readings from the scriptures were an integral part of Jewish worship and the first disciples came from that tradition. In the immediate post-apostolic era the proclamation from the scriptures had become an integral part of Christian worship. In the writings of St. Justin Martyr, c. 150, we have the earliest known account of a Mass; “And on the day called Sunday, all who live in cities or in the country gather together in one place, and the memoirs of the apostles or the writings of the prophets are read; as long as time permits; then, when the reader has ceased, the president verbally instructs, and exhorts to the imitation of these good things. Then we all rise together and pray, and, as we before said, when our prayer is ended, bread and wine and water are brought, and the president in like manner offers prayers and thanksgivings, according to his ability, and the people assent, saying Amen, and there is a distribution to each, and a participation of that over which thanks have been given, and to those absent a portion is sent by the deacons." By the third or fourth century the role of lector and what they proclaimed was beginning to develop an importance of their own. Before the reading began, the bishop would pick up the book and hand it to the lector by this simple action indicating the worthiness of the book and his appointment of a reader to serve as a minster for the people. We know that a lectionary was used in Christian worship early in the history of the Church but prior to the sixth century none have survived. It appears that they were not as comprehensive as the lectionary we use today. The development of the lectionary continued through the Middle Ages and the one-year cycle of readings established after the Council of Trent served the church for 400 years until the Second Vatican Council. The author of the Letter to the Hebrews writes that: “The word of God is something alive and active: it cuts more incisively than any two-edged sword: it can seek out the place where the soul is divided from the spirit, or the joints from the marrow; it can pass judgement on secret emotions and thoughts." (4: 12-13). The ministry of the lector takes the cold dead text of the printed word and through its proclamation turns it into something living, something that can change the lives of those who hear it. The lector takes ancient words and through speaking those words turns them into something applicable to our modern world. A lector is someone of faith who has nurtured a relationship with God through their love of the sacred scriptures, they seek to develop that relationship through prayer and meditation on what the read and on what they proclaim. A lector is someone for whom the word of God is so important that they want to bring it alive for their brothers and sisters. “When the Sacred Scriptures are read in the Church, God himself speaks to his people, and Christ, present in his own word, proclaims the Gospel. General Instruction of the Roman Missal 29. In addition to an ever growing and deepening relationship with the Lord in the Sacred Scriptures you will be asked to assist with the proclamation of these at the weekend and occasionally at the weekday Masses. There is a rota, see link below, so for most weeks you will not be on duty. You can still attend your usual Mass and will not be asked to change your Mass going routine. Normally two lectors are present at each Sunday Mass (although in cases of a 'no show' you may be required to fulfil the role of both). If there is no cantor at the Mass you will also be asked to lead the Responsorial Psalm and Gospel Acclamation. In addition you will be asked to read the announcements before Mass starts and, if Deacon Michael is absent, to lead the Bidding Prayers. There is no rota for the weekday Masses but if you do attend please do not hesitate to volunteer. 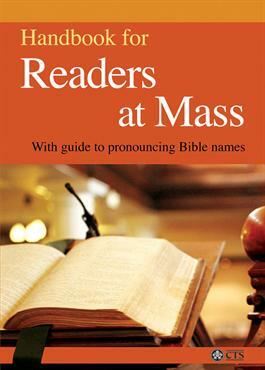 Virgina Meagher and Paul Turner (2006) - Guide for Lectors. [The Liturgical Ministry Series]. Chicago. Liturgy Training Publications. Catholic Bishops' Conference of England and Wales (2005) - Celebrating the Mass; a pastoral introduction. London. Catholic Truth Society. (PDF file).